I love soup in the Winter, and this Winter I have been all about kale. I've bought it a bunch and using it in this soup is quite possibly my favorite thing. 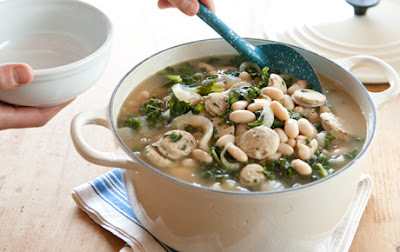 I have made this White Bean, Sausage and Kale soup about three times since the weather got colder, and I plan to have it even more. It is super easy to make, delicious and pretty healthy (especially if you go for lower fat sausage). I make my soup in a dutch oven like the one pictured above. Here's the delicious, wonderful recipe! * if canned beans aren't your thing, you can also make with 1 cup of dry navy beans and follow the procedure for rinsing and cooking and all that. (1) bring pot of salted water to boil. Add kale and simmer until kale is bright green & tender, about 2 minutes. Drain in strainer and cool under cold running water. Set aside. (2) Heat olive oil over medium heat in soup pot. Brown sausage about 5 minutes. remove sausage from pot. Add shallots to pot and cook about 3 mins, until soft. Pour in splash of chicken broth to scrape up any browned bits of sausage. (3) Return sausage to pot along with beans and liquid from can. Stir in chicken broth. Bring to boil. Reduce heat to low and simmer uncovered 15 minutes. Add kale and cook 4 minutes longer. Season with salt, pepper and hot sauce to taste. There you go! Please give this one a try and let me know how you like it. I bet you'll be turned on to this soup as much as I am. return the favor?.I'm trying to in finding issues to enhance my website!I guess its good enough to make use of some of your ideas! !